I was fishing on a northern Wisconsin lake, and had just casted my Mepps spinner too far onto the bank. As I thrashed my lure back out through the sedges in water less than a foot deep, the glassy surface erupted. There was no “hook set” on my first musky, just holding on for dear life as it tail-walked across the shallows, forty-four and one half inches out of the water. I will never forget the power of that musky on a warm July night, and I will also never forget my first introduction to one of the most formidable predators around. In the following years I researched muskies and met folks from all walks of life who cared about them. At boat ramps, gas stations, bars, and grocery stores I was regaled in stories of “the big one” by diehard musky anglers and lucky bobber fishermen alike. These are the memories of a lifetime, and it is our responsibility to ensure that our children’s children have the same opportunity. The future of fishing relies on such memories, as do the livelihoods of those gas station and grocery store employees whose businesses boom all summer long. 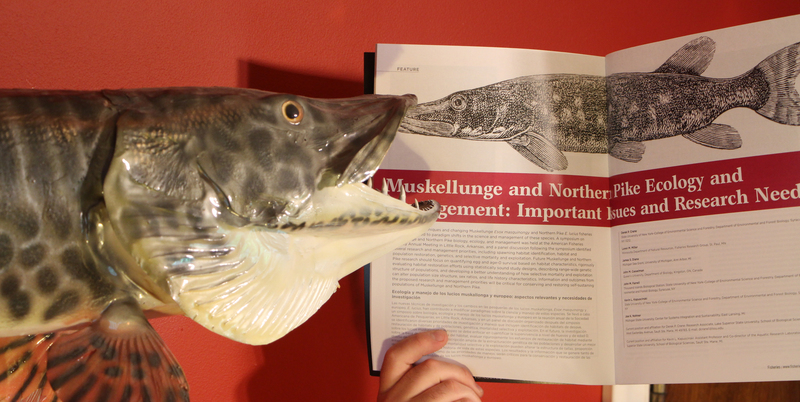 A replica of my first tiger musky (northern pike x muskellunge hybrid) reads up on tips to benefit future musky and northern pike. The future of muskellunge and northern pike faces many challenges. Our recent paper in Fisheries highlights some of the most pressing research and management issues for these two species. One of the most critical aspects of ensuring a future for these fishes includes protecting their ability to reproduce. Our team of muskellunge and pike researchers recommends greater efforts to protect and enhance spawning habitats so that these fish can support themselves. Short-term solutions such as stocking treat the symptoms of poor reproduction; we must treat the cause. Good water quality, aquatic plants, and downed timber are all important factors affecting these fishes. We recommend government agencies, fishing groups, and the property owners on shorelines and watersheds that affect our lakes and rivers increase their efforts to identify, protect, and restore pike and muskellunge spawning habitat. Our team recommends careful attention be paid to the genetics of each population; Michigan’s efforts to shift toward stocking strains of muskellunge that are appropriate to the water body (i.e. Great Lakes strains) is a step in the right direction. We also recommend protecting the “big, old, fat, females” in each population. These larger fish help to maintain an appropriate size structure in their populations; release the big fish so they can go eat all those “hammer handle” northern pike! As you can see in the picture above, life-like replicas of your once-in-a-lifetime fish can be made that will last much longer and allow your fish to be caught again and again. Finally, we must control the spread of invasive species and fish diseases. Removing plant material, rinsing your live well and boat with a bleach solution, and taking care not to release or remove fish into new water bodies are all good steps to preserve opportunities for our children’s children to hook The Big One. To learn more about science and management issues facing muskellunge and northern pike, I encourage you to read our full paper here. As always, if you would like to learn more or have problems downloading a copy, email me and I will be happy to help!